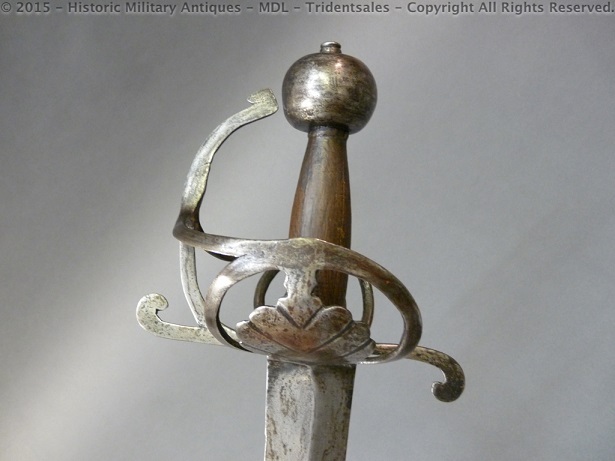 Forum Index > Historical Arms Talk > Is there a correct term for these types of hilts? Posted: Sat 09 Sep, 2017 2:53 am Post subject: Is there a correct term for these types of hilts? I really like the lines of this type of hilt and I'm looking to reproduce it. I have read that these are often associated with the Jamestown colony, but I cannot find anything supporting that except that an example was found there. Can anyone help with any further info? 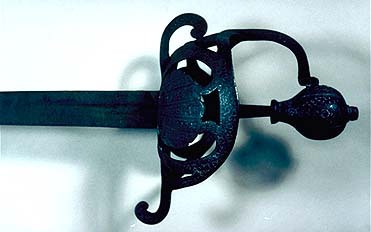 The curved metal guard is termed a "knuckle guard", if I am not mistaken. Is this what you were looking for? 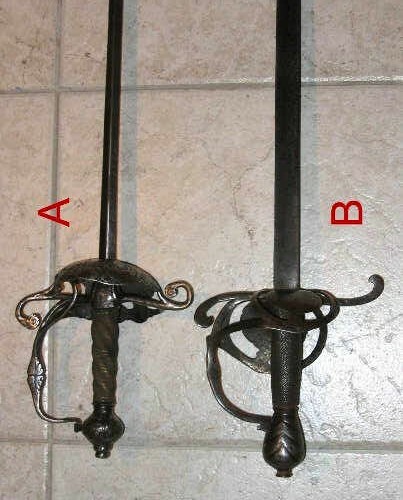 Otherwise, look up swords like Sinclair Swords, the Pallasch, Broadswords. They should fit what you are looking for. Mark, I agree that "English half-basket" is a pretty reasonable description. 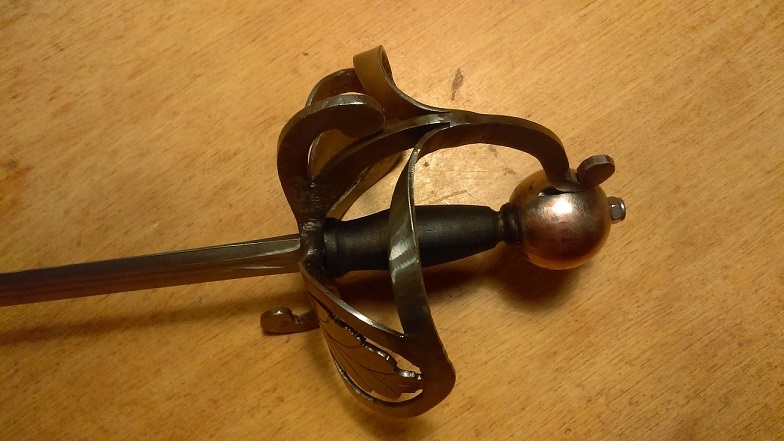 Though, any image search for that term results in nothing appearing that looks even close to this hilt design. Craig, thanks for the suggestions. 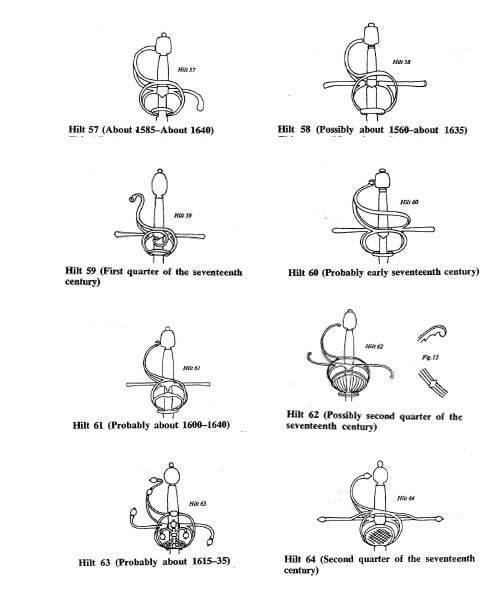 I'm familiar with the parts of hilt construction and their nomenclature. 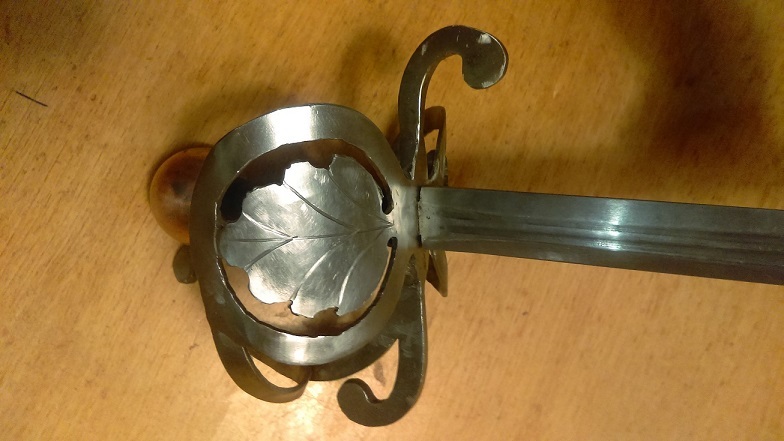 What I'm looking for is if hilt with this general layout have a particular term grouping them - regardless of the type of blade they're fitted to. Also, if they come from a particular area or maker- most examples appear to be English in origin but not exclusively so. 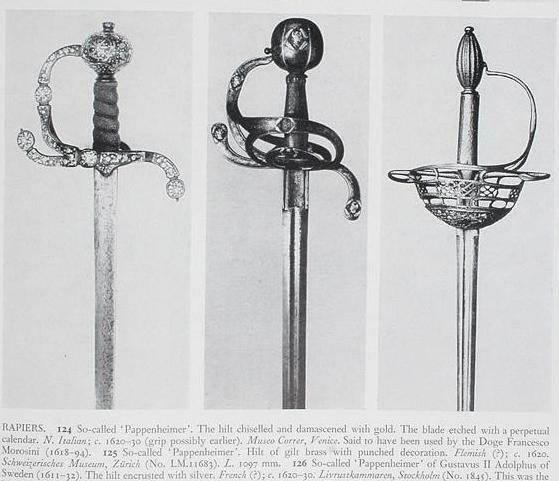 My research so far has found them on rapiers, broadswords, backswords and "riding swords". Oakeshott attempted a very rudimentary classification of English seventeenth century hilts in his book, "European Weapons and Armour". On p. 164 he calls hilts of the type discussed in this thread as an English hilt D. I'm not advocating that we follow Oakeshott here; I'm just pointing out that at least he made an attempt to give a name to hilts of this style. 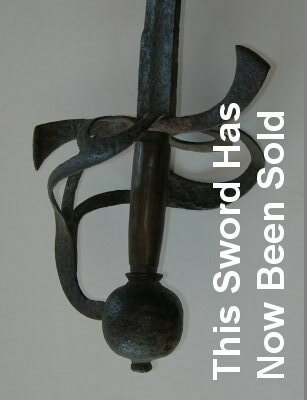 I have been interested in this hilt type since the mid-1980s, when I acquired one for my antique collection. Besides the one I have, and the ones already shown in this thread, the West Point museum has one, and Plymouth Colony had one on display about 15 years ago. The Wigington collection in England had one back around 1985, John C. Denner has sold a couple over the years, and they infrequently show up in auctions. 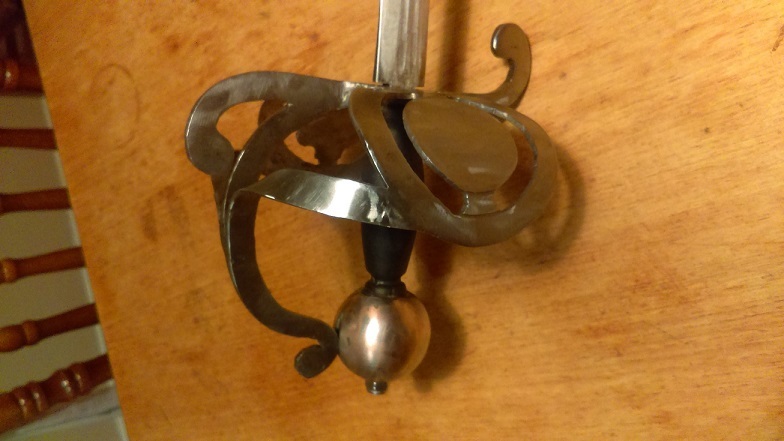 Sometimes dealers/auctioneers call these swords English rapiers, even though they obviously have back or broadsword blades! The small photo that I have attached is from the auction of the William Guthmann Collection, auctioned off in 2006. I'll look around to see if I have a photo of my sword. 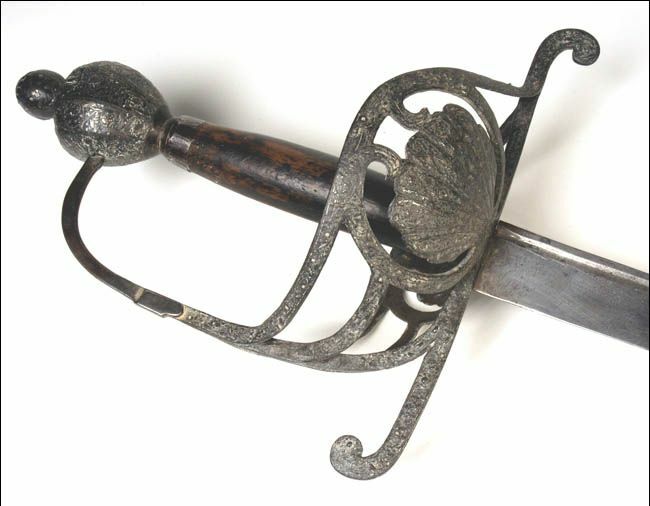 In published works they are often simply called "English Rapiers" or "English Rapier-hilted swords" regardless of the blade mounted on them. scroll down on that page to see sample pages. Here's another one, this time from Claude Blair's "European and American Arms". 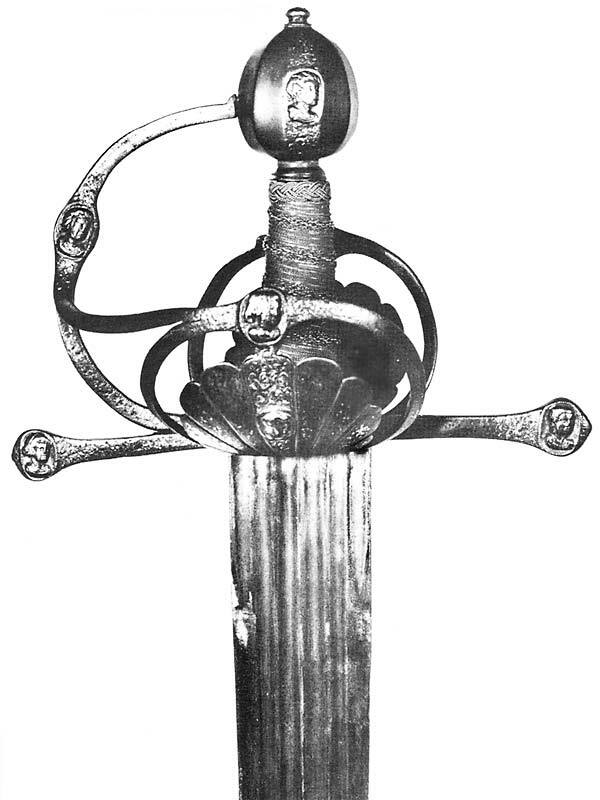 This sword is a high quality example, with gold damascening and silver Roman heads. 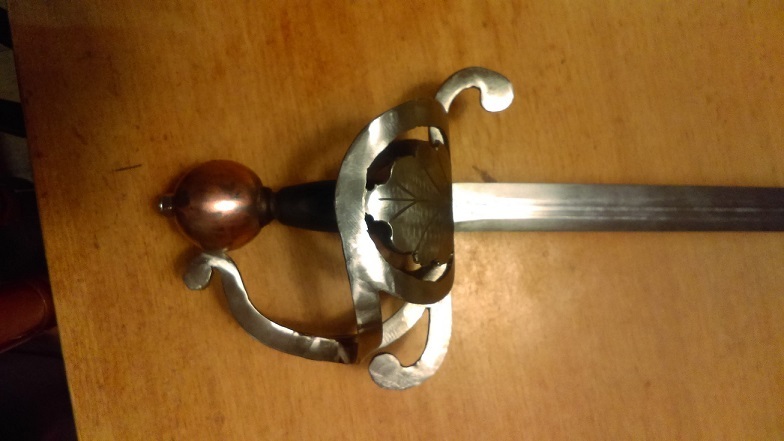 This sword was sold at auction maybe 15(?) years ago, but I can't remember which auction house sold it. I do remember that it went for about $8000. For a color photo of the sword that I pointed out in my message above, see the second post in this thread. I completely missed the color photo provided by the OP! Mr Erickson, thanks for the information and the photo- I really appeaciate it. 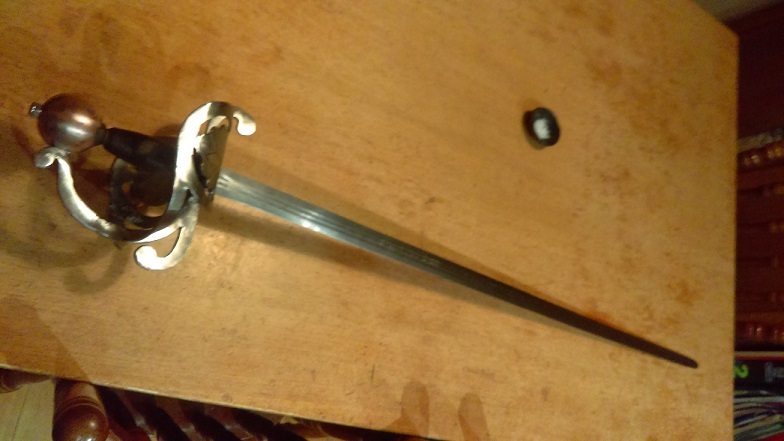 I'm attempting to make this type of hilt for a backsword. The method of construction seems plain enough. What I haven't bee able to find are images of the basket/helt directly from the rear. I'm curious about the curves of the lateral plates- is it a gradual curve, a quadrant- or what? So, I put this together as my first attempt at recreating one of these hilts. I'm reasonably happy with it, but, possibly, I have gone too wide with the side plates. I think that your recreation is rather well done, especially for a first try at this style of sword. You have managed to capture the "feel" of one of these! Minor suggestions: narrow the width of the hilt elements a tad, and make the bars that connect the shell to the knucklebow twist the other way. I did feel that the width of the bars were a little too big. It makes the whole piece look a little heavy. I wanted to make it reasonably robust as the fella I made it for wants to train and bout with it on a weekly basis. He didn't request anything other that "protective and durable." Yes, that was a silly mistake to have the bars twist the wrong way. I had a head of steam built up and I didn't consult the images of the historic examples before I forged ahead with this area. I will be able to make another, improved, one of these hilts much easier in the future.